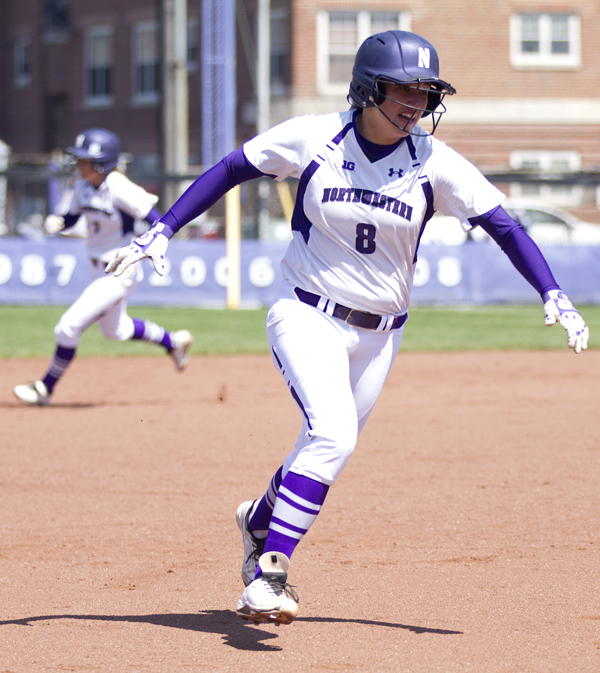 It was another perfect week for Northwestern softball, while Wildcat baseball lost a coach to retirement and a series to ranked Illinois. First Base: Stevens stepping down. A mid-week press release announced that NU head baseball coach Paul Stevens is set to retire at the end of the 2015 season, his 31st at Northwestern. Stevens has never led the Wildcats to the NCAA tournament in 28 seasons at the helm, but he has coached former major leaguers Joe Girardi and Mark Loretta as well as current pros JA Happ and George Kontos. Stevens’ son Trevor played for the Wildcats from 2009-2013, and his younger son Cody is the team’s starting second baseman. With Rocky Miller Park renovations and Cody’s graduation set for later this year, it’s a good time for Stevens to walk off into the sunset. Matt Portland pitched brilliantly Friday against 15th-ranked Illinois, holding the Illini to one run and six hits over nine innings. Portland’s 126 pitch effort wasn’t enough, however, as the Wildcats managed only one run of their own. The teams remained tied until the Illini broke through for a pair off Jake Stolley in the 13th and won 3-1. Portland has been NU’s best starting pitcher this season by a wide margin; he’s posted a 3.86 ERA in eight starts while Northwestern’s three other primary starters (Reed Mason, Brandon Magallones, and Joe Schindler) have ERAs above 6. Schindler and Magallones struggled in Champaign with the former allowing six earned runs in three and one-third innings Saturday and the latter surrendering seven earned runs in two innings Sunday. Offensively, Joe Hoscheit led the way this weekend, smashing a homer on Saturday and contributing multiple hits in all three games. Kyle Ruchim and Zach Jones stayed hot as well, as both tallied two hits on Friday and three hits on Saturday. It was another strong weekend for Wildcat softball, as NU swept Purdue to improve to 8-0 in Big Ten play. Kristen Wood led the way on the mound once more, setting a new career high by striking out 13 on Friday before breaking that new career high with 14 Ks on Sunday. Wood took a 3-0 lead into the seventh Friday before allowing a game-tying homer and getting saddled with a no-decision, but she earned the victory Sunday and notched her first save of the season on Saturday for good measure. Amy Letourneau also pitched well, throwing a scoreless eighth to earn the win on Friday and allowing only one run in six innings Saturday to pick up another W. Letourneau is 10-1 in her last 11 decisions, while Wood was named Big Ten pitcher of the week. Freshman Sammy Nettling stole the show offensively this weekend by hitting two homers in her first two games at Sharon J. Drysdale Field. Nettling delivered a walk-off homer to right-center in the eighth inning Friday and smacked a solo shot off Welsh-Ryan Arena Saturday to provide a needed insurance run. The Andreas got in on the homer party as well, with Filler crushing a two-run homer on Friday and DiPrima adding a two-run jack of her own on Sunday. Letourneau continued to contribute at the plate as well, driving in two runs in Sunday’s victory. Up next: Both baseball and softball hit the road this weekend. Baseball travels to Michigan State to face the Spartans, who are fresh off a sweep of then-number 23 Oregon last weekend. Softball heads to the Twin Cities for a crucial series against a ranked Golden Gopher team.